Use the form below to inquire about Plantation Resort at Chinnakanal . Use the form below to reserve for Plantation Resort at Chinnakanal . Enjoy a slice of heaven at this Plantation Resort at Chinnakanal set amidst natural geographical formations and streams. 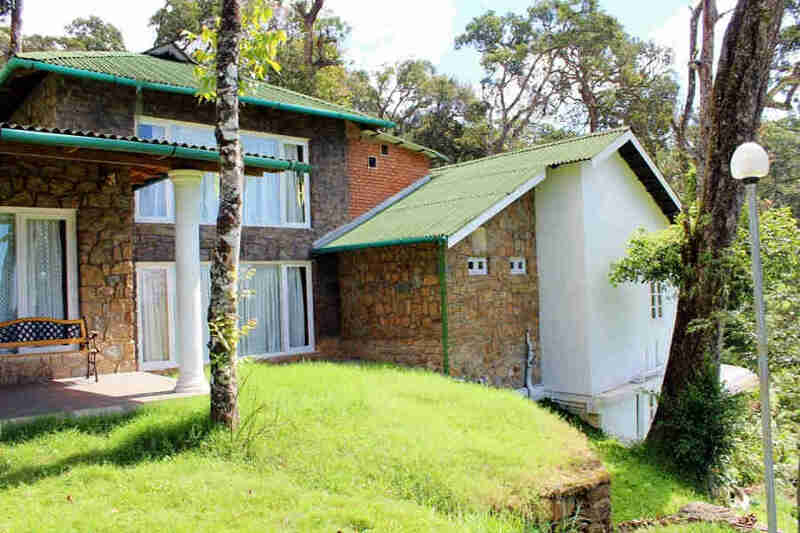 Situated only about 20 km from the popular hill station Munnar, this Plantation Resort at Chinnakanal is a luxurious property nestling within a natural habitat. Natural streams, gigantic rocks, secret caves, and soaring trees that have stood the test of time ensure you get the best of nature and adventure without having to leave the premises. The cluster of bungalows at this Plantation Resort at Chinnakanal built of stone and feature sloping roofs are reminiscent of fairy tales. They have been designed keeping in mind the delicate ecology of the region and the rich flora and fauna of the surroundings. There are partially shaded plantation walkways to enable you to savor what nature has to offer. Wooden furniture is found in abundance across the resort in keeping with the love for natural materials. An Ayurveda spa on the property offers a wide range of rejuvenating treatments and massages for some much-needed pampering. A chef is available on hand round the clock to ensure every meal here is a culinary journey of tastes and flavors. This resort offers 10 spacious rooms divided between three bungalows. Each room has a balcony offering stunning views of the serene plantations and hills. The three categories of rooms at this Plantation Resort at Chinnakanal are – Luxury Cardamom, Classic Clove, and Pepper Colonial. There are four rooms each in the first two categories which come with wooden floors, ceilings, and luxurious décor. Some of the bathrooms open to the sky while others offer rain showers. The two Pepper Colonial rooms are stone clad and the décor is in colonial style. Room heaters are available on request. All these features combined with the excellent service offered by the dedicated staff make this resort a must visit for those who live life king size! Child below 7 yrs is complimentary. Extra Breakfast is charged at INR 300, Lunch- INR 600 and Dinner-INR 750 per person. Food & accommodation for the drivers will be provided. Mandatory Gala Dinner charges for 24th December & 31st December @ Rs. 1500/- per Adult and Rs. 1200/- per child (5-11 years). If canceled, modified or in case of no-show, the total price of the reservation will be charged. This plantation resort has plenty to offer nature lovers and adventure enthusiasts. From complimentary plantation walks with experienced guides to a village tour where you can interact with the locals to cookery classes and a campfire at night, there is enough to keep you busy on the property. You can also arrange for a candlelight dinner if you wish to serenade your significant other. Adjacent to the resort is Sunset Point and also Anayerangal Lake which has a reservoir that is a great spot for some elephant watching. You can also trek up to Chokramudi Mountain which is one of the highest among the Munnar mountain range. The base is around a 15 minute drive from the resort while the trek can last for at least four hours. You can also head for Munnar town for some exploration of this quaint town. Cochin International Airport is the nearest at a distance of 119 km. Madurai Airport is at 139 km while Kempegowda International Airport, Bangalore, is nearly 536 km away. Udumalpet is the nearest railway station at 106 km while Pollachi Junction is at 131 km. Ernakulam railway station is 127 km away while Bangalore railway station is at a distance of 510 km. It is 83 km to Thodupuzha via NH85. Palani is 128 km via Udumalpet – Munnar road while Ernakulam is 127 km away via NH8. Bangalore is 502 km away via NH44.